Planning the big day can be overwhelming, especially when you start thinking about a beauty plan. As tempting as it may be amidst your crazy schedule to put off your pre-wedding beauty regimen, the more time you spend on yourself the better you will look and feel when the wedding finally arrives. Besides the obvious hair, skin and fitness routines, we think it's especially important for you (and your fiancé) to focus on mental health, so be sure to schedule in some non-wedding related down-time (a couple's massage just might be the perfect remedy for wedding-overload!). Start a fitness routine: Experts recommend breaking a sweat 3-4 times a week for at least a half-hour per session. Running not your thing? Try switching it up with a few classes like yoga, Pilates and Zumba. Fitness memberships can be a motivating option and help you stick with the workouts long after saying "I do". Begin a skincare routine: Collaborate with your esthetician to create a personalized homecare routine. Find what works best for your skin and stick with it. Now is not the time to be experimenting with a new product every week. For that signature bridal glow, schedule 3-5 regular custom facials over the next six months, depending on your skin concerns. This would also be the time to include any additional peels/treatments. Start drinking water: Aim for eight 80z glasses per day to maintain a healthy digestive system. Your skin will also reap the benefits. Schedule appointments with hair stylist: Experiment with hair colors and styles to match your dress and day. Maintain regular trims and schedule deep conditioning treatments (every 6-8 weeks) to keep hair healthy. Start a full-body skincare routine to maximize relaxation, balance and glow: Consider treatments that include a full body exfoliation and maximize hydration, like a cellulite reduction process or a mud wrap. This is also a great time for a detox. 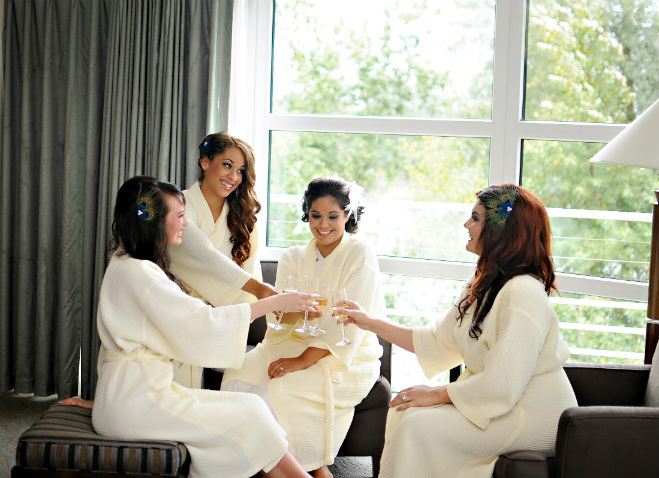 Schedule spa treatments for yourself and the bridal party for the day-of: Consultant your bridesmaids, mom, the mother of the groom and any other ladies you'd like joining you the morning of. Find out what treatments they'll be interested in (mani, pedi, hair, makeup etc.) and schedule all accordingly. It's a good idea to schedule your hair and makeup towards the end, so you'll be as fresh as possible when it comes time to walk down the aisle. Stress-relief: Most of the major details are set. While you're wrapping up the little things and getting ready to welcome guests into town, set some quality time aside for you and your significant other. Agree to put wedding planning to the side and plan a special day to recharge, refocus and enjoy the final weeks of being engaged. A couple's massage, a jacuzzi soak with champagne and chocolates? Choose something that will leave both of you feeling refreshed. Makeup consultation: Sultry and smoky? Glowing and natural? The venue is booked, the dress is purchased. Now's the time to narrow down your wedding day look. Visit a makeup artist for a final consultation (preferably on a night where you have something special planned!) and consider any makeup purchases you'll need to make so reapplications are a breeze. Early morning workout: A low-impact workout the morning-of is the perfect way to shake those wedding day jitters and get energized for the long day ahead. 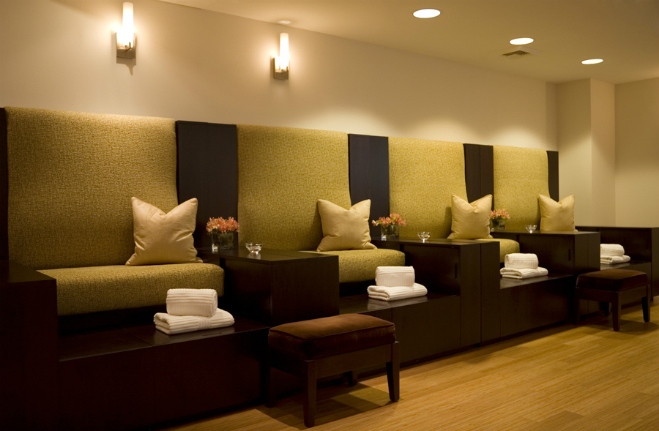 Hair, nails, and makeup: Relax and let yourself be pampered. Enjoy breakfast and champagne with your bridesmaids. You've spent months preparing for this day, allow yourself to feel your most beautiful. Situated on the banks of the Willamette River, River's Edge Hotel & Spa combines upscale surroundings with warm Pacific Northwest hospitality. 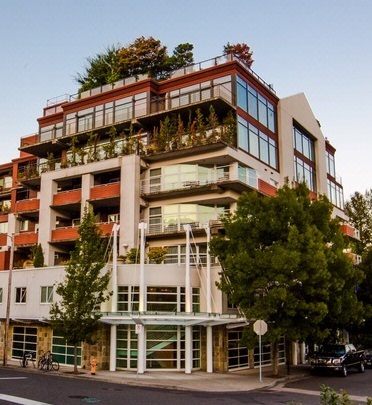 Considered Portland’s “Urban Retreat”, guests of the environmentally friendly deluxe boutique hotel enjoy thoughtful service, modern amenities and the best of creature comforts.